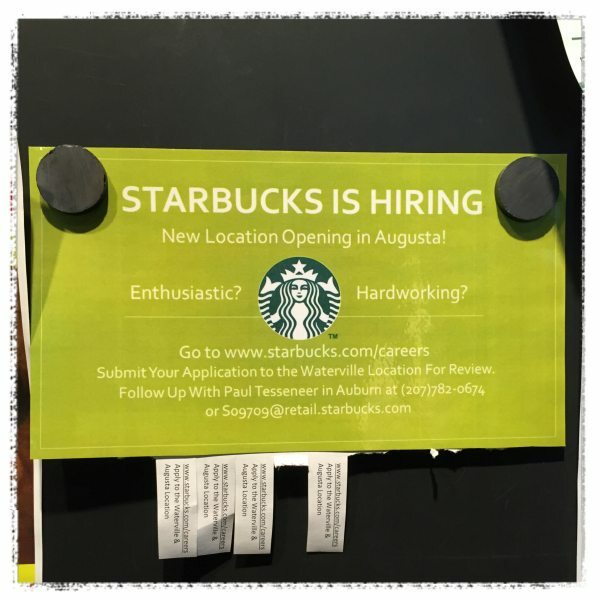 Starbucks is Hiring, and so are we at Seasons of Smiles Dental. This morning while checking out a bulletin board in Lewiston, I saw this posted. Starbucks is hiring. I thought it was cute, and an effective way of getting the word out. We are hiring in Camden, Maine as well. We currently have two part-time positions available. 1) We are searching for a dental hygienist that is looking for work. Maybe you need to pick up an extra day or so? Throughout the years, we have met some great new graduates that are having a hard time finding their first office, and we are reaching out to you too. If you, or someone you know, is interested, please send them here. 2) We are also looking for a part-time dental assistant, no previous experience necessary. I think this opening would be perfect for a mother who needs a few extra hours in the morning to get the kids off to school and then go hang out with some fun people while getting paid and still get home in time to pick up the kids from the school bus. If you, or someone you know, might fit this description, please look here. In both instances, we are looking for people who love their community, and love working with people.